As the cold fronts blast in and out of Florida like an undecided whirl wind, most residents are finding themselves oscillating between hot and cold on a daily basis. Many will be toggling their air conditioner between cool and heat, often two or three times a day. As you can imagine, this might have an impact on your electric bill. In fact, it could send it skyrocketing, depending on what kind of system you have. After the first month of truly cold weather, Leon noticed his bill increased dramatically, and he called in to find out what could be the cause. What it came down to was a fundamental misunderstanding of how different systems work. I explained to Leon that while he once had a gas furnace, he now has what is called a Straight Cool System. This means that the only source of heat is located in the air handler inside the home. 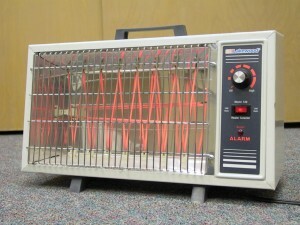 This source of heat is called a heat strip, made of coils that heat up, much like a toaster. The alternative to this, the heat pump system, works differently. This system reverses the flow of refrigerant and warms the refrigerant that passes through the copper by extracting heat from the outside air (there are also types that extract heat from the ground and water). Energy Insight: While this kind of heat is not always as warm coming through the vents, it is a more efficient way to heat a home. Heat strips use up to 3 times as much energy as heat pumps. Leon discovered this the hard way. His question then was whether or not he should use space heaters instead. Good question… if you asked me. It comes down to this: If you live alone, in a small home or apartment, and you just want enough warmth to get by in one room at a time, then a space heater may be your best option. A space heater could get you through these chilly days and nights just fine. Especially considering the fact that the cold fronts come and go the way they do and flipping between Heat and A/C is best to avoid if at all possible. Then again, perhaps you give the professionals a call to discuss your situation. After all, not all systems and homes are built the same… Who knows, maybe you could be saving money without risking your comfort. All in all, it’s worth the research. If you have any questions about your specific heating arrangement, feel free to give us a call at 321.972.9935 or visit us at http://www.ACNotWorking.com and we’ll help you figure out what’sright for you.